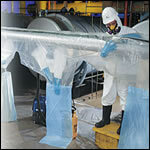 We sell asbestos glove bags for the safe removal of asbestos and other hazards. This is a product guide to help you determine which type of glove bag is best for your project. If you're ready to buy, click the button to head to our webstore. We offer many types of glove bags including Grayling Avail's QuickTwist models in your choice of standard or vertical. 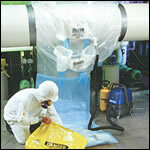 These asbestos glove bags incorporate all the safety and labor saving features of traditional glove bags, plus a radical new debris chamber design that makes it safer and easier for workers to twist off the asbestos waste area.The QuickTwist design has two distinct work zones, the removal area and the debris chamber. This two-stage design makes it safer and easier for workers to remove and securely separate asbestos debris-laden bags from pipe. The QuickTwist incorporates a larger work area with a narrower and taller debris chamber so that less bunching is required to twist close the glove bag. The increased work area gives the worker greater freedom inside the glove bag to access difficult pipe insulation. Each debris chamber is tall enough to handle intact sections of pipe insulation, less breakage of debris means lower fiber counts. Grayling's Extended Run glove bags come in an extra long roll of 25 glove bags. They can be easily seperated to the length you require. This saves massive amounts of set-up time compared to individual bags that would be required on long pipes. We have many varieties of extended run bags available. Check out our products below! The most popular, and versatile asbestos glove bag in the collection, the QT10 fits pipe diameters up to 10" and removes 42" to 54" of pipe insulation per bag. It handles 40% more insulation than a 4460 style glove bag. This bag replaces the 4460 through 6060 style glove bags. When larger diameters of pipe are encountered, the QT14 is the asbestos glove bag for the job. It safely encloses pipe diameters from 10" to 14" and handles 48" to 60" of pipe insulation per bag. A perfect replacement for the 6072 style glove bag. Large pipe diameters from 14" to 18" are no problem for this QT18 model. 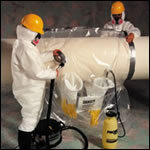 Two sets of glove sleeves let the worker easily reach and remove 54" to 66" of pipe insulation. This bag replaces the 6684 style glove bag. This super sized AVAIL model asbestos glove bag handles pipe diameters from 18" to 30" and replaces the 72120. Ideal for larger pipes, valves and fittings where more work area is required. Three sets of glovesleeves let workers remove 60" to 72" of pipe insulation. Available vertical models solve worker productivity problems by offering features which assist in the removal process. Debris weight and bulk is channeled away from the work area by the offset debris chamber. Awkward twisting and turning of the bag is eliminated due to the work area separation from the debris area. Installation is quick and simple with fitted collars and pre-cut bag opening. 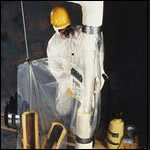 The Avail asbestos glove bag that set the industry standard for work on vertical pipe. Encloses pipe insulation diameters up to 10", and can safely contain a 3.5’ vertical work area. One arm set per chamber, stocked in 6 mil and available in 10 mil special order. These asbestos glove bags are perfect for larger diameter vertical pipes that need two workers to reach around the insulation. Two arm sets per chamber eliminate awkward bag twisting to reach difficult areas. 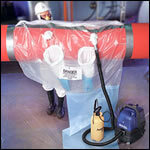 Encloses pipe insulation diameters up to 24", and can safely contain a 3.5’ vertical work area. Stocked in 6 mil and available in 10 mil. 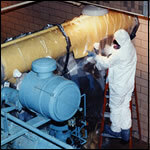 The revolutionary way to tackle extended-run sections of pipe insulation. Dramatically increase productivity and safety by eliminating multiple bag set-up time and reducing jobsite fiber counts. Use in sections of 2 to 25 chambers at a time. Dispenses quickly and easily while protecting unused bags from contamination in Grayling's bag-on-a-roll zip-strip package. 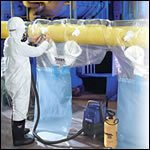 4460 Asbestos Glove Bags | Extended Run | EXT 44" x 60"
The basic Extended-Run asbestos glove bag. This economy model has all the features of the Available line except the entry ports. Enclose pipe diameters up to 8" in runs of 6’ to 91’ of horizontal pipe. Each of the 25 chambers measures 44" x 60" allowing you to cut of as many or as few as you need. One arm set per chamber, stocked in 6 mil, available in 10 mil special order. 5460 Asbestos Glove Bags | Extended Run | EXT 54" x 60"
The asbestos glove bag that set the industry standard for efficiency and safety. This contractor's favorite encloses pipe insulation diameters up to 10", and can safely contain 8’ to 112’ of horizontal pipe. Each of the 25 chambers measures 54" x 60" with one arm set per chamber, stocked in 6 mil, available in 10 mil special order. 6072 Asbestos Glove Bags | Extended Run | EXT 60" x 72"
The workhorse asbestos glove bag for extended runs of large diameter pipe. Encloses pipe diameters up to 14", and can safely contain anywhere from 8’ to 100’ of horizontal pipe. Each of the 20 chambers measure 60" x 72", allowing you to cut off as few or as many as you need. 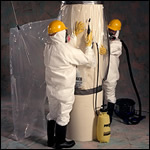 One arm set per chamber, stocked in 6 mil and available in 10 mil special order. 6684-2 Asbestos Glove Bags | Extended Run | EXT 66" x 84"
This asbestos glove bag model eliminates awkward bag twisting to reach difficult areas with two arm sets per chamber that allow work from either side of the pipe. Encloses pipe insulation diameters up to 18", and can safely contain from 9’ to 82’ of horizontal pipe. Each of the 15 chambers measure 66" x 84", allowing you to cut off as many as you need. Stocked in 6 mil and available in 10 mil special order. 77120 Asbestos Glove Bags | Extended Run | 72" x 120"
• The standard, single-use asbestos glove bag that revolutionized the industry with labor saving features. Smart design details such as quick attach collars, HEPA/water entry ports, Fiber Guard glove sleeves and arm openings placed so the weight of debris doesn’t rest on the worker make these bags the choice of abatement professionals.